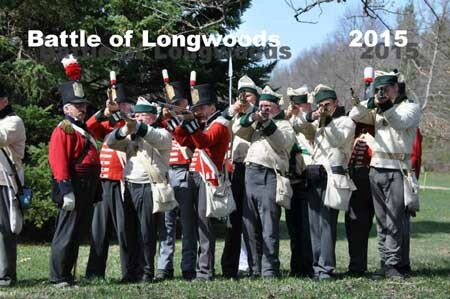 The Battle of Longwoods weather over the years is always a factor. This weekend’s weather was exceptional! We would like to again thank our hosts The Royal Scots for again providing the site and scenarios for the battles and skirmishes. Like many of us, a couple of our new recruits got their first taste of 1812 life at The Battle of Longwoods. They both came back to camp grinning from ear to ear, after each of the battles! Photos are c/o Andrew Flint, John Stephens, Sarah Brown, Ron Philips, and of course, Deb Brown! A great Youtube is available that shows almost the entire battle from the air! Ten of our members and 4 Campfollowers were able to make time to support the Georgina Pioneer Village's Rise To Rebellion School Program. The original Incorporated Militia was recalled in 1837 to help with the rebellion. By the time they had responded, the rebellion was over! Almost 600 kids over the two days arrived as members of the the Loyalists or Rebels. They worked through different stations and followed the leaders of the two sides to battle and the retreat of MacKenzie! Our stations included Drill, Kit and Caboodle, The Role of Women and English Country dancing! Not sure who had the most fun, our people or the kids!